NMS is proud to announce (and shamelessly plug) that the fine folks at BLIPSHIFT are offering Brian's great t-shirt design the CONEAVORE for a limited time, like the next 3 days only. Here's the link to Brian's design, which we think looks best on a t-shirt that you wear, so check it out and order one today! 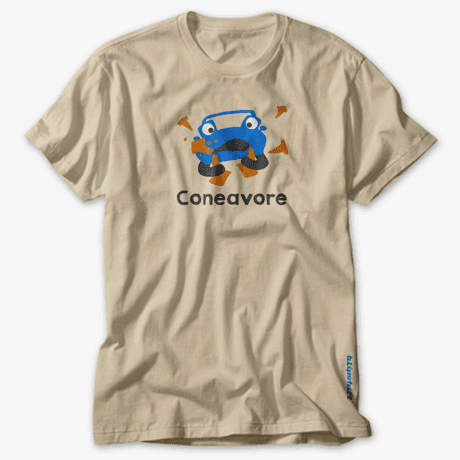 If you don't know what a Coneavore is, well, it's a car that eats cones. As in a certain NMS Miata that hits a lot of cones on an autocross course. If I have to explain it any more than that it won't be as funny, so I'll just mention that this year's version has a BLUE Miata, so you can also think of the shirt as a Cookie Monster version. FULL DISCLOSURE: Besides making you a member of the cool autocross kid's club, each Coneavore t-shirt sold by Blipshift also benefits NMS' favorite starving artist and t-shirt designer extraordinaire Brian Nixon. They make great Christmas presents. And Birthday presents. And "hey today is a lunar eclipse on the other side of the Earth" presents!